Lace-making is an age-old tradition throughout Galicia, particularly along its extensive coastline, but the true heart of the art is in Camariñas, a sleepy village on the "Costa da Morte", where the sea also weaves its foamy lace amongst the rocks and cliffs. Here you will be entranced with the sound of the clicking of bobbins and reels and the sight of little old ladies in black beavering away at their task. 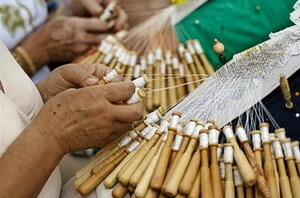 A special time to go there is at Easter for the Camariñas Lace Fair which attacts lace makers from all over the world and includes displays, sales and competitions.